Clementine Pound Cake is full of sweet clementines and topped with a clementine cake glaze offering a deliciously light, sweet pound cake to enjoy as a dessert or breakfast treat. There are certain moments in time when the baking gods are on your side and what you envision in your head actually comes out the way you thought it would and then there are times when it comes out so much better than you ever expected. This is the delicious outcome of the recipe for Clementine Pound Cake. We are nearing the end of clementine season, so it was exciting when my last trip to the market yielded the sweetest bunch yet! Not wanting them to go to waste, I thought of different recipes I could try such as cookies, muffins, or maybe scones? Then the light bulb moment came, how about a pound cake? We could enjoy with morning coffee AND enjoy as a dessert. I’ve made lemon pound cake and strawberry pound cakes, but this time I wanted something more on the sweeter side rather than tart and clementines seemed to be a perfect choice. Tip 1: Be careful zesting this fruit. Unlike lemons, limes and bigger cousin orange, clementines do not have the white pith separating the fruit from the skin to let you know when to stop your Microplane . 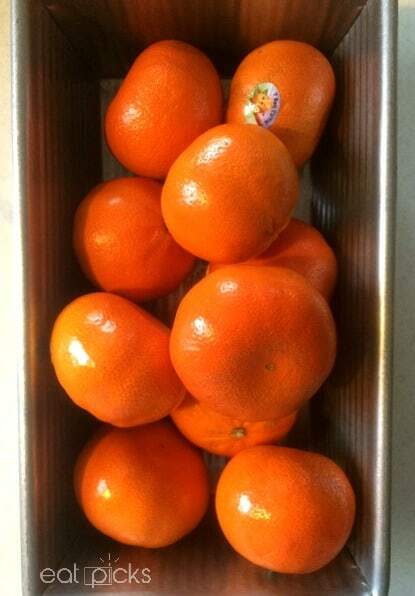 Clementines have orange all the way through the skin, so when you zest, be sure to do so with a light hand. Tip 2: Do not over bake your clementine pound cake. When recipe testing, we found the initial baking of 30 minutes was definitely NOT long enough. The center of cake cracked, but remained very “jiggly.” The ideal baking time was revealed to be 45-55 minutes. 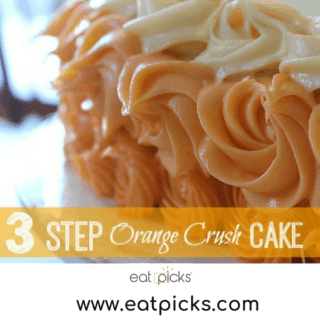 If your cake is still testing not done by the desired time, because we all know every oven is different, then continue to bake in 5-minute increments until a toothpick tests clean. Clementine cake glaze is the cherry on top for this tasty cake. It is surprisingly light and creates a thin crisp coating that is absolutely delicious! If you want to add a burst of flavor to your cooking or baking, squeeze a little bit of lemon on your finished dish. Needing a little pizazz in your baked goods? Then try a bit of orange, lemon or lime zest using a Microplane . Here is our wonderful recipe for Clementine Pound Cake. I hope you try it and come back and let us know how you liked it! 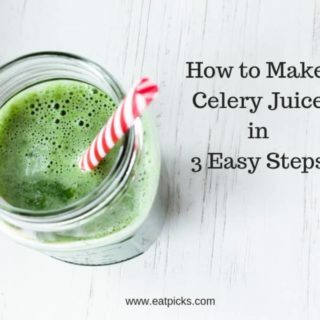 A printable recipe is below! Sweet Clementines make a super delicious pound cake complete with clementine glaze. Perfect for snack or dessert! In small bowl, zest skin of 6 clementine fruit. Set aside. Prepare loaf pan by greasing lightly with butter. In mixer bowl, cream the butter and sugar. Add 1/3 of flour mixture to mixer bowl, then half juice. Alternate until all flour and juice have been added. Add vanilla and zest and mix until combined. Pour batter into prepared loaf pan and smooth out top. Bake for 40-50 minutes until cake tester comes clean from center of loaf. If still liquidy, bake in 5 minute increments until golden brown and tester is clean. While cake is baking, make the glaze. In bowl combine sugar and juice of 2 clementine and set aside. Place a sheet of wax paper underneath a cooling rack. Remove cake and let cool in pan for 5 minutes. With wooden skewer, poke holes in top of warm cake. Pour glaze slowly over top so it can soak in. I’m having a cup of coffee right now and how I’d love a slice of this deliciousness to go with it. Pinning! This is great with coffee- not that I would know… haha! OH YUMMY! 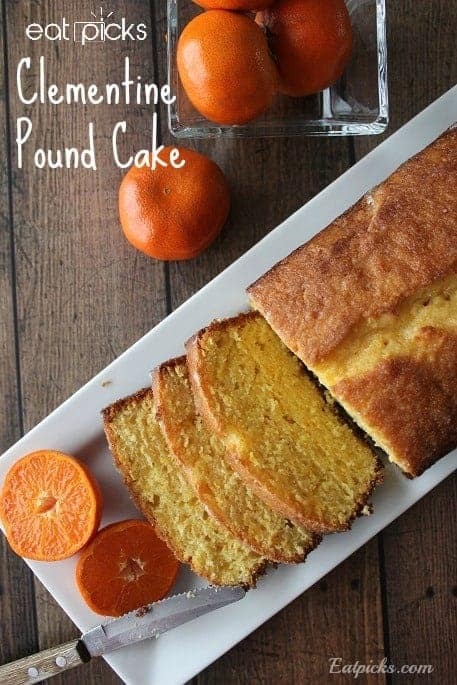 I love clementines and I LOVE pound cake!! This looks awesome! I love clementine too- and this made such a wonderful cake. I look forward to making it again!